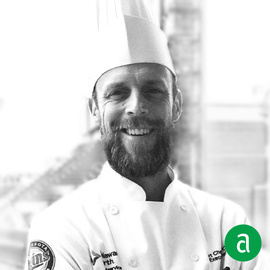 Kurt Chenier, Executive Chef of Target Field in Minneapolis, shares his career timeline and words of advice for up-and-coming professionals. When I was in college, I was working at a pizzeria. I loved the hard work aspect, making stuff, and looking back at the day and feeling accomplished. When I realized I could use my business skills in the industry, I never thought twice of doing anything else. You can be a great cook but if you can’t develop and manage people, and create a teamwork atmosphere, you’re going to sink. No one person can do this job; you need your team and your people to be successful. If you can’t get them to see the vision you have, it will be very difficult. I keep my team inspired by keeping them motivated. The camaraderie that you build is key to building a great team! Don’t ever put yourself on a platform and choose to always lead by example. I work with my team, show them that I’m as invested as they are. I cannot do my job without coffee! And of course the support of my family. I would say that most of the trends that I keep up with are with what I see locally through social media and local newspapers. We also incorporate local restaurants into the stadium. We are lucky as we get to do a lot of travel to other stadiums to support each other and get to work with chefs from around the country. You really get to expose yourself to different cultures this way. Every year, our company does a food and beverage summit, where we share ideas and workshops. We don’t hire the person with the best experience, we hire the candidates that are coachable and personable. One of my mentors once told me: "Don’t try to fix everything in one day, because it’s impossible. Fix one thing fully, and then move on to the next.” This has stuck with me every since! I think that a lot of people have it or they don’t and you have to have the drive and the motivation to work really hard. There are very few people that have what it takes to do the job, day in and day out. Since I can remember, I’ve always been known to be a hard worker, which provided me with the foundation and drive to grow in the industry. If you don’t have the physical and mental strength, it’s nearly impossible to be successful in our industry.